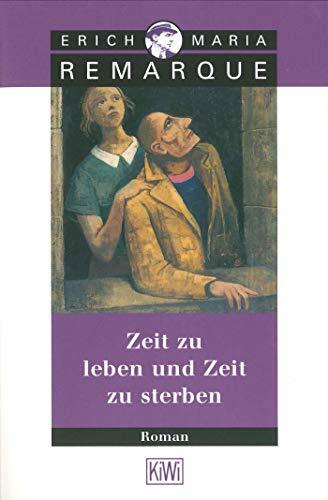 Notwithstanding the picture to the right, which I chose because I like it, I did not read the full original text of Erich Maria Remarque's Zeit zu Leben und Zeit zu Sterben. I read an abridgment for students published in 1961 with a dull cover that I couldn't find a picture of anyway. The title translates to A Time to Live and a Time to Die, and it's a lesser-known (at least to me) work by the author of All Quiet on the Western Front. A love for human beings and hatred of war run throughout Remarque's work. I felt that even with my elementary knowledge of German. Like the earlier novel, this one explores the terrible waste of war through the experiences of a young German soldier. Unlike the first, this book is set during the second war, and its hero, Graeber, is profoundly anti-Nazi, although he fights in Russia. The bulk of the book takes place while he is on leave in his hometown. His time in Russia before and after his leave bookends the beginning and end of the story. ...es war die Landschaft selber, die plotzlich sprach. Sie kam von allen Seiten, suss, besturzend, und voll jaher Erinnerungen. Sie war nicht klar, sie hatte nichts von Tatsachen, sie war kaum mehr als die Ahnung von Wiederkehr, nicht Wiederkehr selbst; aber gerade dadurch war sie um vieles starker. Die dammernden Alleen der Traume waren in ihr, und sie hatten kein Ende. ...it was the landscape itself, that suddenly spoke. It came from all sides, sweet, disconcerting, and full of sudden memories. It was not clear, it had nothing of reality, it was hardly more than the idea of return, not return itself; but just because of that it was much stronger. The dusky avenues of dreams were in it, and they had no end. I struggled with gerade dadurch. Gerade can mean "just," "straight," or maybe "immediately," in different contexts, and dadurch means "therethrough" or "through it." In this passage it seems to mean something like "just through that," which sounds better as "just because of that." Anyway, in my head, without trying to translate word for word, it was beautiful. Wonderful review with a short storyline and your own impressions reading in a 2nd language. It is such a challenge and can be addictive! With my knowledge of Dutch I could follow the quote but went way off the track with ..."Die dammernden Alleen ..." Bravo! I didn't know that Dutch and German were that similar--that's neat. "Dammerung" is twilight, so "dammernden" means twilit or dusky. But guess what? You'll appreciate this. I was in the library yesterday and found a copy of the book in English, and I looked up the passage that I translated above, so I could see how a proper translation compared with mine. Virtually the same! Even better, "gerade dadurch," which I had translated as "just because of that," was rendered as "just for that reason." I was absurdly excited, lol.